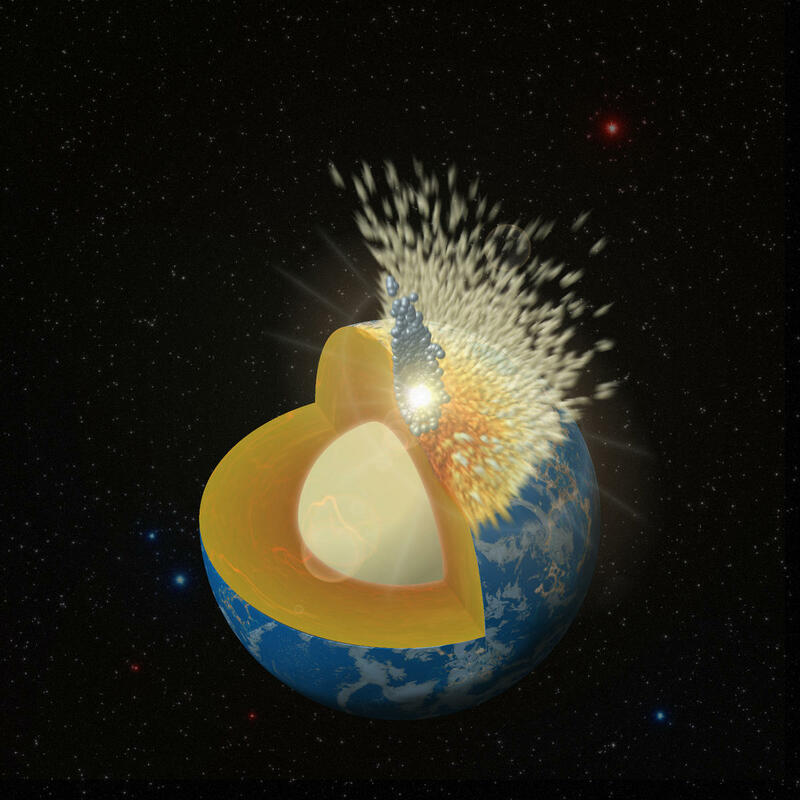 December 4, 2017 – Southwest Research Institute scientists recently modeled the protracted period of bombardment following the Moon’s formation, when leftover planetesimals pounded the Earth. Based on these simulations, scientists theorize that moon-sized objects delivered more mass to the Earth than previously thought. Previously, scientists estimated that materials from planetesimals integrated during the final stage of terrestrial planet formation made up about half a percent of the Earth’s present mass. This is based on the concentration of highly “siderophile” elements — metals such as gold, platinum and iridium, which have an affinity for iron — in the Earth’s mantle. The relative abundance of these elements in the mantle points to late accretion, after Earth’s core had formed. But the estimate assumes that all highly siderophile elements delivered by the later impacts were retained in the mantle. Late accretion may have involved large differentiated projectiles. These impactors may have concentrated the highly siderophile elements primarily in their metallic cores. New high-resolution impact simulations by researchers at SwRI and the University of Maryland show that substantial portions of a large planetesimal’s core could descend to, and be assimilated into, the Earth’s core — or ricochet back into space and escape the planet entirely. Both outcomes reduce the amount of highly siderophile elements added to Earth’s mantle, which implies that two to five times as much material may have been delivered than previously thought. The paper, “Heterogeneous delivery of silicate and metal to the Earth by large planetesimals,” was published December 4 online in Nature Geoscience. The research was funded by NASA’s Solar System Exploration Research Virtual Institute and a NASA Exobiology grant.